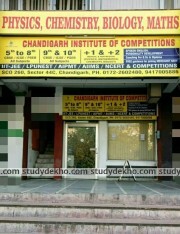 Goyal Coaching Center situated in Sector-32, Chandigarh is one of kind institute for various courses. It has helped various students to get into desired college and course over the years. They educate the students for engineering mathematics (M1, M2, and M3). It also has course offerings for preparation for medical and non-medical entrances including MBA, MCA, BBA etc. Other than these courses they also offer NDA entrance preparation. It excels in providing worthy guidance for the better shaping of their career and grades. It provides best of their faculty and guidance to students to achieve their dreams. With an experienced faculty and deep knowledge of the various entrances, they have proved them over time in their proficiency in preparing students for a better future. For shaping up your career it is a good choice for the students to excel in their field of interest. You can get yourself a visit to the place for availing yourself to any of the course or to know better about the courses and faculty. Teacher is very knowledgeable ,dedicated and cooperative. He gives attention to each student and works on the student individually. Good coaching cetnter.